It was one of the few books in Mum's house when she was little, and she would have read it at the same time as the author, Laura Orvieto, became a target of Mussolini's racial laws. 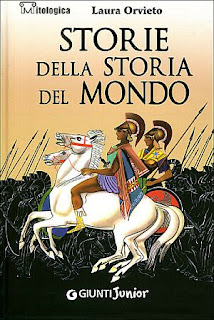 As the cover of our current copy, pictured above, makes immediately clear, those stories of the history of the world are ancient Greek myths, which Orvieto rewrote for children. The events covered are roughly those leading up to and including the contents of the Iliad, and are presented in a plain and engaging manner, but also without pulling any punches: most notably, the sequence makes no omission of the episode of Atreus tricking Thyestes into eating his own children, and naturally it is the one I remembered most vividly from my own early encounters with the book. Grisly details aside, reading those stories as a child was a source of pure joy; a feeling of discovery, yes, but also the sense of tapping into something primeval, the matrix from which all other stories came from. I didn't go to Sunday school, so that was my education into the fables of our origin. Our family holidays in the south of Italy - the Magna Graecia - and those August nights spent connecting the stars in the manner of the ancients did the rest: by the time we travelled to Greece itself, in 1981, it felt like a pilgrimage to a hallowed place and yet also a homecoming. As for Orvieto's book, I forgot about it for some years, and the family's copy got lost, but once I had children of my own I was delighted to discover that it was still in print and bought it for our oldest, Joseph. He fell in love with it at once, just as he had with the Māori myths and legends, as if the Hellespont was just around the corner or Maui and Ulysses happened to be cousins. Which perhaps they are. I am grateful to Deborah for introducing me to the work of Marian Maguire, currently showing at the Adam Art Gallery in Wellington. 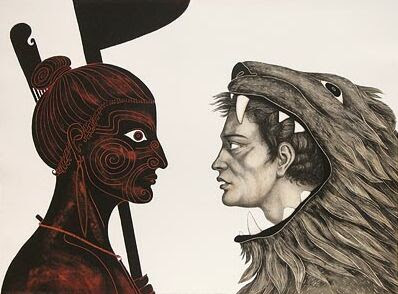 The series on display, The Labours of Herakles, is based on the same conceit as her earlier Odyssey of Captain Cook: what if Aotearoa and the tāngata whenua had come into contact with the ancient Greek world? To be more specific, not the actual ancient Greek world either, but rather its aestheticised, stylised double that survives in its iconic art forms and through the stories and legends that so fascinated me in my childhood. The Herakles who lands in New Zealand is the supernatural hero of myth transported through time and space, sometimes appearing in the form of a two-dimensional figure in silhouette, as if he had just been carefully detached from a black-figure vase, sometimes as a full-bodied mortal looking every bit as real as the harsh environment that surrounds him. But it’s not a linear progression, nor does it offer consistent coordinates for interpretation. As Elizabeth Rankin documents in her very careful study of Maguire’s images and their sources, the interplay of representational forms within the lithographs and across the series is very complex and purposeful: it’s not merely a case of transposing Greek figures depicted in their originary style into an early colonial New Zealand setting to produce frisson and novelty, but rather a constant exchange of styles and forms - Attic black figure vase painting and Māori motifs and iconography alongside more naturalistic Nineteenth Century styles of illustration, painting and photography, all borrowing from each other at different junctures and sometimes within the same image. There is no straightforward, fixed solution to this interplay, no algorithm that solves within each scene the riddle of whose gaze is fixed on whom, asserting its power over the subject. The overall effect, as Rankin notes, is to highlight ‘the complexities of post-colonial understandings of early New Zealand history’. That the series manages to do so entertainingly and accessibly is just another notable and praiseworthy trait. And the lithographs are simply exquisite, a joy to behold on site for those who can make it to this exhibition. But therein lies also a conundrum: for in light of the proliferation of pseudo-histories so valiantly fought by some of my worthier colleagues in the blogosphere, and more generally the wretched state of the public conversation concerning the Treaty, the most fundamental aspects of the nation’s history and our race relations, the liberties taken by Maguire may themselves come under scrutiny. 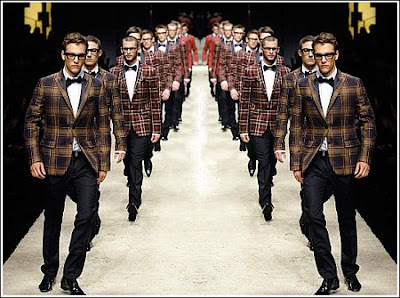 What of the choice, in the first instance, to cast the coloniser as a mythical and invincible hero? Here too the series confounds our expectations, for the transplanted Herakles is a most troubled character - unsettled, unsure of himself and prone to sometimes comical failures, as when he attempts to repel the Amazons, limit the rabbit population or even fashion a chariot out of number eight wire. In his rare exalted moments he may feel able to vanquish the natives at will, but in the end he has to negotiate terms with them. Crucially, he fails in his most cherished bid - building the new Arcadia - and his temples are no sooner erected that they fall into ruin. Yet in spite of the comic vein that runs through many of the lithographs and especially the etchings in the series, Herakles is no mere figure of fun either. He is capable of reflection and contemplation, and has moments of awareness - shot through with a weary melancholy - of the irreparable impact of his labours on the spiritual and physical lay of the land. 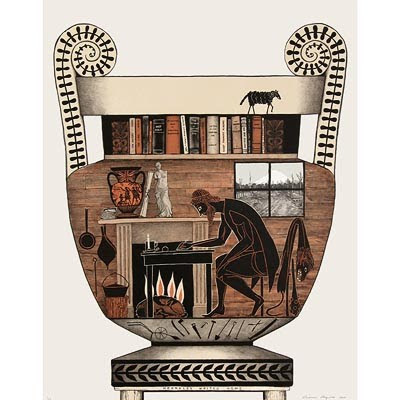 In another key image we see him in his cabin, intent on writing a letter home, and it is at such moments - culminating in the surprising and frankly moving Herakles Goes to Gallipoli - that we witness his transformation into what we may be inclined to call a New Zealander. Rankin notes here the anachronistic mix of books on the shelf above Herakles, which includes The Iliad and The Odyssey next The Bible and Darwin’s Origin of the Species, The Voyages of Captain James Cook alongside John Boardman’s handbook on Greek vase painting, but it is the inclusion of a Greek to Māori dictionary that ties us into the image of the negotiation of boundaries above and thus to the series’ main theme: the problematic coming together, literally face to face, of two cultures, each trying to comprehend and at the same time draw, write, define the other. It is from the force of that central image - which echoes in turn the earlier, seminal Ko wai koe? (Who Are You?) from The Odyssey of Captain Cook - that Maguire’s reflection on the constantly changing nature of post-colonial identities draws its strength. As a migrant from Southern Europe who feels (fancifully, no doubt) culturally closer to ancient Greece than to modern Britain, that image and those themes spoke to me very powerfully, but so did Maguire’s capacity to draw into her images the history of art forms that are also technologies of memory. On this she has written very compellingly in the introduction of The Odyssey of Captain Cook, stating her intimate love of the printed artwork and the work of the engravers of two to three hundred years ago, who translated into reproducible form the work of the artists who accompanied the great explorers, sometimes stretching the limited record of those voyages by using the same characters and scenes into different New World settings. In our wan postmodernity these philosophical balances are far more fragile, the negotiation of cultural boundaries, modes of representation and means to construct identity meaner and faster. Marian Maguire's art is an inspiring example of how to chart imaginatively this uncertain territory. 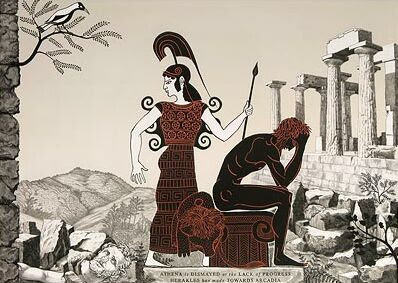 The Labours of Herakles will be showing at the Adam Art Gallery in Wellington until December 19th. Entry is by koha. The excellent catalogues of the exhibition and of The Odyssey of Captain Cook are available at the gallery or through PaperGraphica. Or you can track Herakles' whereabouts here. Elizabeth Rankin, 'Ko wai koe? (Who Are You? ): Reading Marian Maguire's Labours of Herakles', in Marian Maguire, The Labours of Herakles, (Christchurch, PaperGraphica, 2008), p. 10. Marian Maguire, The Odyssey of Captain Cook (Christchurch, PaperGraphica, 2005), p. 6.
from his hump and we'll finally know how it all went. The history of post-War Italy is the story of one long, uninterrupted conspiracy. From May 1st 1947, when a commando taking orders from gangster Salvatore Giuliano opened fire on a peaceful Labour Day demonstration at Portella della Ginestra, Sicily, through to the bombings at Piazza Fontana and at the railway station in Bologna, the subversive plots of the Propaganda 2 lodge and the atrocious blockbuster-style murders of judges Giovanni Falcone and Paolo Borsellino along with their police escorts, the relationship between politics, the mafia and the forces of reaction and neofascism have been made visible - in an often pointedly, arrogantly spectacular manner - and at the same time obfuscated, hidden by layers of state secrecy, smokescreen operations, disinformation campaigns, juridical impotence. Few of these crimes have resulted in convictions, and when they did it was never the instigators, the masterminds who went to jail, but always just gli esecutori materiali, the criminal workforce, mirroring the manner in which social justice was administered in the country at large. The occasional judgments that dared to go further, following the trail of blood from our streets into the rooms of the decision-makers, were either reversed on appeal or fell just short of naming names, pointing generically to a palace of power, or to the headquarters of our secret service, intimating that beyond that the investigators had not been allowed to go. There was always a door at the end of a long corridor that could not be opened. 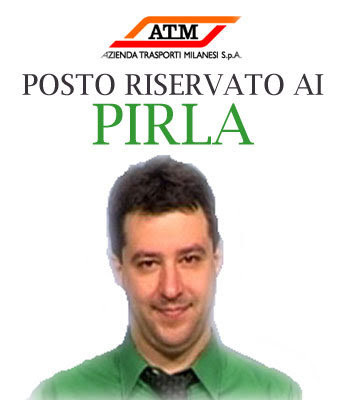 Thus for instance there was a period of time - precisely between 17 November 2002 and 30 October 2003 - when the pre-eminent politician of our Republican era, Giulio Andreotti, was guilty before the nation and the State of having ordered the murder of journalist Mino Pecorelli, a crime for which he was to spend 24 years in prison; but that was all duly reversed by the Court of Cassation, and the door was shut again, as it almost always has been. Andreotti has since been able to return not only to his life as a free citizen, but also to the post of lifetime senator, one of Italy’s highest honours. In a country where political longevity is in itself a likely sign of culpability, the figure of Andreotti is amongst the most notable constants in this whole history: he was there in 1947 as a member of our constitutional assembly when Giuliano’s men mowed down the Labour Day marchers; and he was there again for his seventh and last term as a Prime Minister in 1992, when a portion of the motorway near Capaci was blown up just as the car of Giovanni Falcone drove by. More significantly, his and that of his fellow Christian Democrats was the power that to a lesser or greater degree all of these murders and acts of domestic terrorism served to cement; his was the interest that was being served. People who marvel at Silvio Berlusconi’s ability to withstand scandals relating to the financing of his enterprises would do well to reflect on this: Italians have accepted far worse from their leaders. Underlying that acceptance is a failure to process history, the diffuse sense that everybody knew everything and at the same time nobody knew anything: just as our judiciary and our institutions were sometimes able to investigate but always powerless to indict and prosecute, so as a society we have always stopped short of making that final connection and withdrawing our trust and our votes from the people who stood to benefit from the brutality that surrounds us. Your lively, innocent, enchanted eyes didn't know, don't know and will never know. They have no idea of the deeds that power must commit to ensure the well-being and development of the country. For too long that power was me. The monstrous, unavowable contradiction: Perpetrating evil to guarantee good. The monstrous contradiction that made me a cynical man that even you couldn't decipher. Your lively, innocent eyes don't know the responsibility. The direct and indirect responsibility for all the carnage in Italy from 1969 to 1984 that left precisely 236 dead and 817 injured. To all the families of the victims I say that I confess. I confess that it was my fault, my most grievous fault. I'll say it, even if it's pointless. Havoc used to destabilize the country, to provoke terror to isolate the extremist parties and strengthen the centre ones like the Christian Democrats... has been described as "tension strategy". It would be more correct to say: "Survival strategy". Roberto, Michele, Giorgio, Carlo Alberto, Giovanni, Mino, dear Aldo, by vocation or necessity, all confirmed lovers of the truth. All bombs ready to explode that were defused into silence. All of them thinking truth is the right thing, but actually it's the end of the world. We can't allow the end of the world in the name of what is right. Thus Andreotti's fantasy confession, in the form of an interior monologue addressed to his wife Lidia, in Paolo Sorrentino's extraordinary and important Il divo (The Deity, 2008). Andreotti himself, who saw the film at a private screening ahead of its premiere, described it as a mascalzonata, a cowardly trick played on a man whose power had waned, and one might well ponder on the film's timing and the position of relative safety and remove from which the accusations are levelled. But Il divo isn't so much about Andreotti the man as it is about truth and politics, truth in our politics, in our lives. And like Nanni Moretti's Il caimano (The Caiman, 2006) it finds us wanting, unable to interrogate our history or pass meaningful judgments - unequal, victimised parties to that Faustian bargain that has kept the likes of Andreotti and Berlusconi in power and the country from being torn apart by its social tensions, its historical contradictions, its desire to seek the truth and pursue a different kind of justice. Il divo is a cosmic tragedy - its protagonist casting a shadow so obviously reminiscent of Shakespeare's Richard - and it rivals in ferocity some our best cinema di denuncia, from Rosi to Petri to Damiani, without yet matching its civil and moral outrage. In this it reflects I think the different historical moment, the sense of things universally known yet so effectively and complicitly removed from the collective consciousness. The problem for us has become how to sensitise ourselves again to the enormity of those offences, how to short-circuit the logic of listless acceptance of this truculent history of ours: flying cars, exploding trains, the enemies of the state silenced with bullets and strychnine-laced coffees, or left to swing under a bridge in London. Sorrentino treats it for what it is, a grotesque gallery of pulp fictions, compressed to fit the duration of the screening in a rapid-fire sequence that leaves little time to pity the victims. And perhaps that’s what it felt like to Giulio Andreotti, our seven times Prime Minister, twenty-eight times cabinet minister, who lived through it all and had to keep it all quiet. I have something else too: A vast archive in place of an imagination. Every time I mention it, those who should shut up do so, as if by magic. Andreotti’s private archive, where information wasn’t so much collected as it was made to disappear. Perhaps some day it will be recovered and its truths will pour forth, providing materials to historians, journalists and other chroniclers of a century full of darkness. But in the meantime it is the man himself, that hunched, frail old man, whose mind alone knows all that there is to know, and who therefore holds the key to all that silence. There is in that respect an image that will stay with me, and it isn’t in Sorrentino’s film: it is Andreotti himself, taking part some time after the release of Il divo in one of those insufferable Sunday afternoon variety shows that infest Italian television. Asked by the host a grotesquely misguided yet at the same time absolutely typical question - “What about the children, Mr Prime Minister, what future do you wish for our children?” - Andreotti, then aged eighty-nine, remained frozen, seemingly unaware that he had even been asked a question. After nearly a minute the programme cut to commercials, and when it came back Andreotti had recovered from what was in all likelihood a mild stroke and was able to continue. To even point you to that episode, to that moment of human frailty, and link to the video of it, may seem unnecessary and cruel, another mascalzonata. But it struck me then, as it does now, that it was an emblematic moment: that long, uncomfortable, interminable silence, in response to a meaningless question he had no doubt been fed in advance, stood for all the other silences that had come before in the face of much more serious interrogations, and his serene, sphinx-like expression spoke of a man who had come out on the other side of a life-long and almost heroic struggle against the truth. So I come finally to my principal point here, that this latest mutation in space - postmodern hyperspace - has finally succeeded in transcending the capacities of the individual human body to locate itself, to organize its immediate surroundings perceptually, and to map cognitively its position in a mappable external world. Bangkok, Hong Kong, Singapore, Dubai. Increasingly for the modern traveller these aren’t final destinations, but rather stopovers en route to Japan, Europe or North America, Australia or New Zealand. And if it’s not where you’re going, what does it matter where they actually are, except in a vague place in-between? 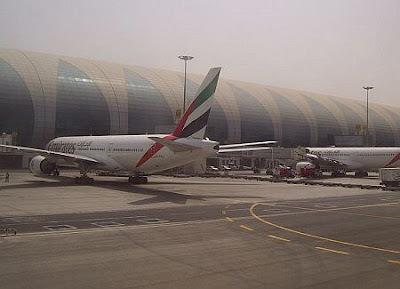 It does not, and accordingly none of these aggressively modern and hyperfunctional airports make much effort to remind you that you are in China as opposed to Thailand 1, or the United Arab Emirates as opposed to pretty much anywhere else on the planet. They are non-places, designed to make you forget who you are and where you are, reducing you to an amorphous and largely anonymous person in transit who has some time to eat and shop before boarding the next plane. 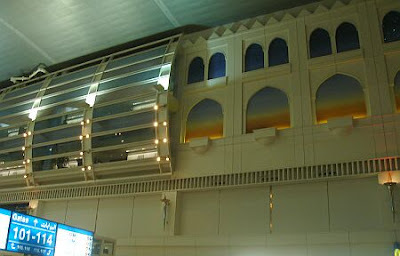 This last trip marked my first time at Dubai International, the largest such hub, and I was duly befuddled and impressed. 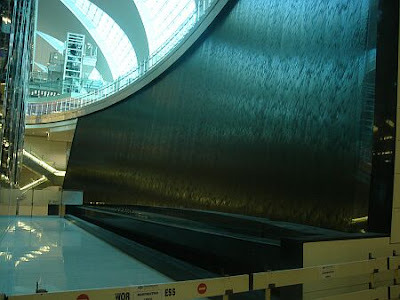 The place is vast, stunningly so, stretching on an east-west axis for a couple of miles - Terminal 3 is in fact the largest building in the world by floor space. Not that I knew that at the time, obviously. Seeing as you rarely get to sit in the cockpit, it’s hard to get a sense of the layout of an airport before you land, and by the time you’ve hit the tarmac, you’re too close to see the thing whole. The glimpse from the window is enough to suggest that the inspiration for the design of this terminal in the middle of the desert must have been the sandworms from Frank Herbert’s Dune. Alternatively, once inside, one gets the feeling that what is being recreated is the belly of a whale, with steel ribs supporting the translucent flanks of the beached leviathan. 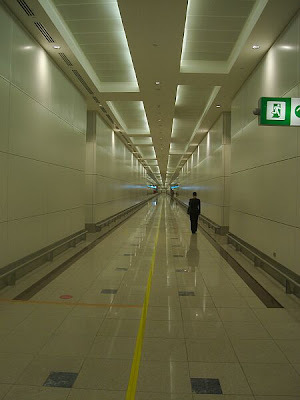 The terminal's elongated shape ought to make orienting oneself very easy, but on such a large scale even walking down a perfectly straight corridor can give the disorienting sensation of not moving at all. or the equally as inevitable, nature-defying indoor forest. The privileging of the commodified, anonymous global dimension over the sociohistorical local mirrors in turn the state of the subject who passes through the terminal. On the occasion of his arch-famous visit at John Portman’s Westin Bonaventure Hotel in downtown Los Angeles, Fredric Jameson was in full possession of his considerable critical faculties and, one assumes, not at all jetlagged. Now, imagine if he had been dropped into one of those elevators halfway through a thirty-hour flight, clutching his passport like a person who might just need to remind himself of his vital statistics. How much sharper would the effects he describes have been? And would he have managed to observe, recall and articulate them as eloquently as he did? 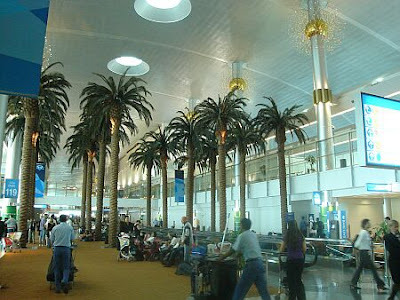 The bamboozled world traveller, a figure of privilege that one might not feel inclined to be unduly sympathetic towards, is nonetheless a vulnerable person, and if you make them walk from one end of the terminal to the other to catch their next flight, you might just be able to squeeze enough money out of them to sustain your giant indoor palm habit. So naturally at the heart of Terminal 3 is a vast duty free mall, selling everything from cosmetics and booze to jewellery and high-end electronics, all strictly from delocalised brands of global renown. It's not quite a full-scale sensory assault, but don't forget that the subjects are already weakened by a punishing travel schedule, their compliance all but guaranteed. 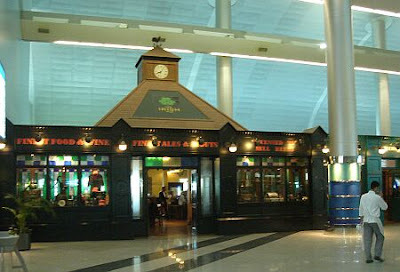 The intercontinental aviation industry is a machinery designed to defy geography, an intent which is mapped directly onto the duty free mall: a non-place inside of another non-place, the world as it is dreamt of by advertisers and marketers, whose denizens are barely conscious automata. No longer citizens, yet perfect consumers: it really is the apotheosis of globalised late-stage capitalism. 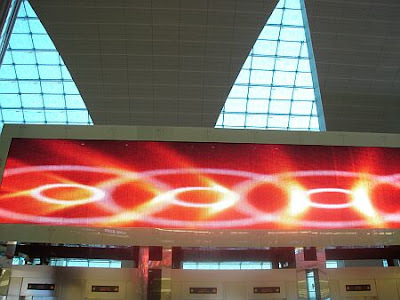 And with its projected annual capacity of 62 million travellers, Dubai International may just give us a glimpse of what the industry is actually about: not getting people where they want to go, but rather getting them halfway there, to the hubs, and force them to walk through the duty free malls. 62 million customers who are dazed, stateless, forgetful, unsure about the rates of exchange and how much things actually cost, yet can be relied upon to sign their names at the bottom of credit card receipts, for that is a reflex. (1) Scratch Thailand, actually - keeniau explains why in the comments. One of the "ronde", vigilante squads authorised by the local council. 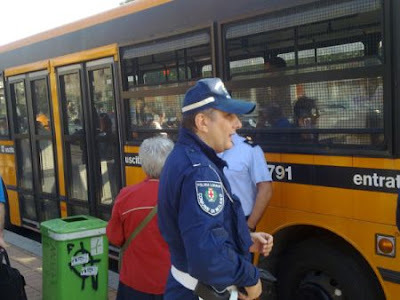 In the words of vice-mayor and Youth Front stalwart Riccardo De Corato: "If people see uniforms, they feel safer". 'This seat is reserved to dicks'. 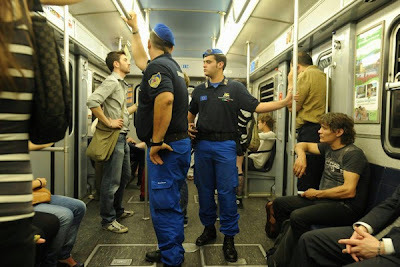 Massimo Salvini, deputy secretary of the Northern League, local councillor and member of the European Parliament, who earlier this year suggested instituting special train carriages for immigrants only. 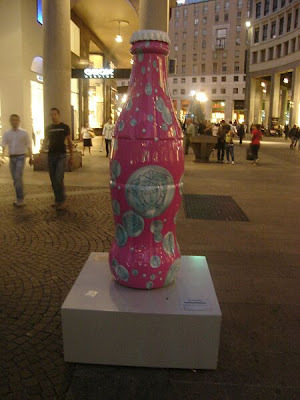 Diet Coke's Homage to Gianni Versace, Corso Vittorio Emanuele, October 2009. No, really. 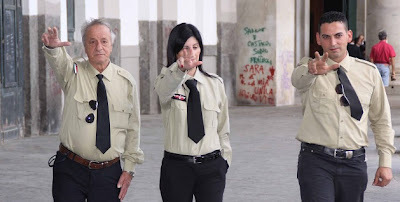 Another trio of vigilantes, in the garb inspired by the neofascist Movimento Sociale Italiano. Don't ask me about the demented salute. An image from the prestigious 2009 Pirelli Calendar. 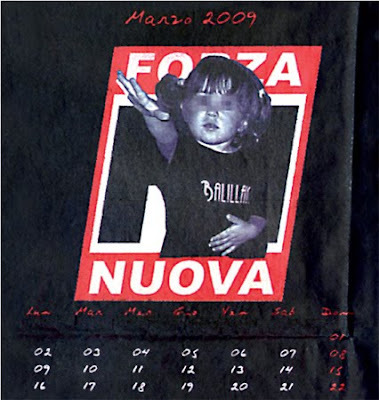 An image from the 2009 Forza Nuova calendar. 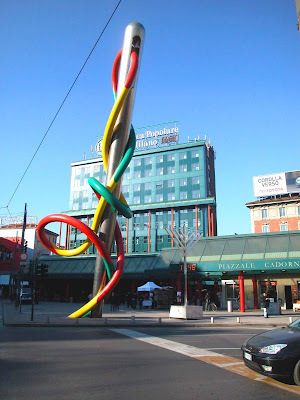 Gae Aulenti's monument to needle and thread, Piazzale Cadorna. 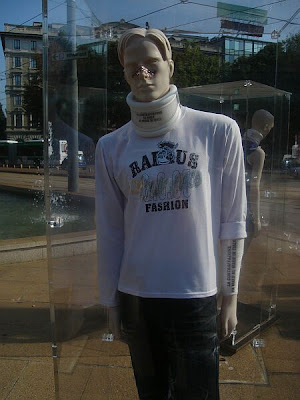 'Counterfeit fashion hurts the Italian industry', Piazzale Cadorna, September 2009. 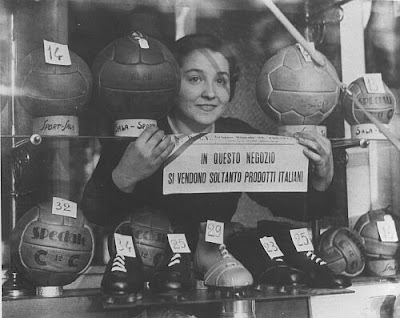 "This shop sells only Italian products", Milan, 1937. Image by Adolfo Porry Camporel. 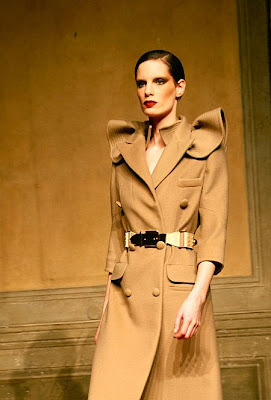 Giorgio Armani, Fall 2009 collection. 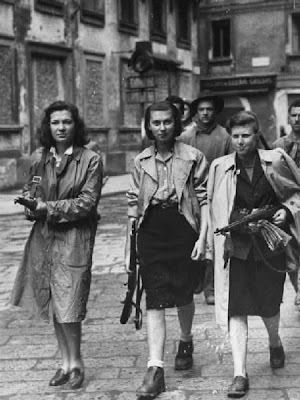 Milan, 1937. 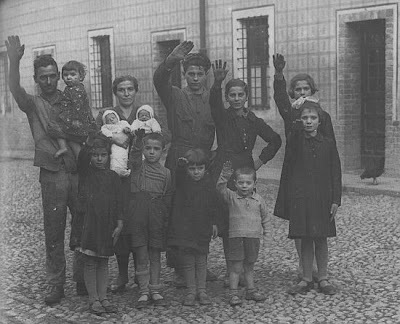 Original caption: "The beautiful Italian families". Image by Tino Petrelli. 'Prison bus' used to round up people who may or may not be guilty of the new crime of illegal immigration. Full set of images here. 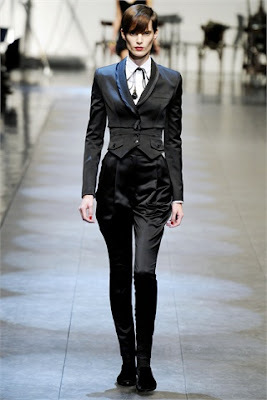 Dolce e Gabbana, 2009 Fall Collection.